Talk, gossip, laughter or tears—with a cup of tea or coffee—has been a comfort and need for women in any century. These days it is easy for us to brew a quick cup of a hot drink, and hardly stop the flow of conversation. Even if it is just a cup of hot water heated up in the microware with a tea bag thrown in…it takes less than two minutes. Back in the pioneer days—depending on if you were traveling or on the homestead—you’d have to gather the wood, start the fire, go outside to a well or creek to draw up a bucket of water, put an enamel pot over the fire to heat up the water, roast and grind the coffee beans, etc (sigh) before even thinking of savoring that hot cup of brew. The time consuming work of getting meals—or even an afternoon cup of coffee on the trail—was very evident when I was researching and writing my Trail of Thread series. For example, Deborah and John Pieratt, featured in the Trail of Thread, the first book of the Trail of Thread series left Kentucky in 1854 when the Territory of Kansas was formed. They were part of the thousands of families that packed wagons and headed east for the promise of a new life. They had to gather wood for a fire for every cup of hot drink they made for three months. I’m sure conversations with other women they met along the trail were welcomed, but short, due to the groups moving on every day. Thimble of Soil, the second book in the series, features Margaret Ralston Kennedy. She was a widow who moved with eight of her thirteen children from Ohio to the Territory Kansas in 1855. She was dedicated to the cause of the North, and helped with the Underground Railroad in both Ohio and Kansas. Did she brew and secretly give hot drinks to people hiding under her watch? Did Margaret have a chance to ask where her visitors were from let alone where they were headed? Orphaned Maggie Kennedy, portrayed in Stitch of Courage, the last book in the series, followed her brothers to Kansas looking for a better life as the states fought out the history of the Civil War. Again, think of the work it took to make a cup of coffee behind the battle lines, and how welcomed a normal conversation with someone from home would have been. This series, written in the form of letters the women have written back home to loved ones portray the life and times of that generation. I wish I could have a cup of tea with one of my ancestors to get to know her, and her way of life. Pretend your husband—or father—decided to leave the home you’ve always known and you’ll be traveling through several states to a new territory he heard about. It’s the nineteenth century and you may not even a paper map to guide your family to this new free land—but he is determined to start a new farm in some wild land behold civilization. My ancestors, John and Deborah Pieratt—with six young children along—left Kentucky in 1854 to move to the new Territory of Kansas. Their journey was the basis of my book Trail of Thread, which was written in the form of letters that Deborah wrote and mailed back to family in Kentucky. Deborah describes what she saw, and what their family experienced on their three-month journey. The family had to carefully plan first so they would be prepared for the journey, and for the wilderness land they would eventually homestead on. Pretend you want to prepare for this journey as a class or family project. What—and how—do you pack in the four by ten foot wagon for a family of eight? (And what do you need for your trip to begin with?!) How much weight can the wagon hold and the oxen (or horses or mules) pull? How long will the trip take? What will be your route? What roads (or rough trails) will you use and what towns will you be traveling through? How will you cross rivers with your wagon? Is there any rough terrain along the way that may make the trip hard and dangerous? How much food should you pack? How do you keep it from spoiling? I brought the Pieratt’s story to life in the pages of Trail of Thread. Now can you plan your own trip in 1854? By definition, a quilt is a coverlet or blanket made of two layers of fabric with a layer of cotton, wool, feathers, or down in between, all stitched firmly together, usually in a decorative crisscross design. The top layer may be a single piece of fabric, or it may be a made from a variety of scraps of material that were pieced together to form blocks, that are then sewn together to make the top layer. When one thinks of pieced quilts, pioneer women automatically come to mind. This group of women often had to move, start new households, and work with what they had on hand. Their quilts would have been used daily, made and patched to last through the rigors of pioneer life. For example Deborah and John Pieratt, featured in the first book of my Trail of Thread series, left Kentucky in 1854 when the Territory of Kansas was formed. They were part of the thousands of families that packed wagons and headed west for the promise of a new life. Quilts would have been used for bedding—in the wagon or on the ground, as a hanging shelter, or as a partition for privacy. They were also used for burial of loved ones along the trail. Thimble of Soil, the second book in the series, features Margaret Ralston Kennedy. She was a widow who moved with eight of her thirteen children from Ohio to the Territory Kansas in 1855. She was dedicated to the cause of the North, and helped with the Underground Railroad in both Ohio and Kansas. It is possible that some of the quilts she made had special blocks giving direction to runaway slaves. Orphaned Maggie Kennedy, portrayed in Stitch of Courage, the last book in the series, followed her brothers to Kansas looking for a better life as the states fought out the history of the Civil War. Women made and gave quilts for the soldiers to use during their journeys and battles. What was the meaning for all these quilts? They were all just fabric to provide warmth and protection, but they also connected the hearts and souls of the past, present, and future. The young woman on the trail packed quilts to use, but also to bring memories of her family left behind to her new frontier home. The older woman—who stitched directions in her quilt that hung outside to air— gave freedom to people trying to escape a bad life. The soldier wrapped in a dirty quilt, trying to keep warm and get a bit of sleep, was given the security of knowing that someone from home was thinking of him and waiting for his return. Think of the countless hours of work and devotion it took to create these pioneer quilts. These finished masterpieces of the fingers gave a sense of accomplishment to the makers, and comfort and connection to the users. Do you have a special quilt passed down through your family? What does it mean to you? Hello from the Kansas prairie! 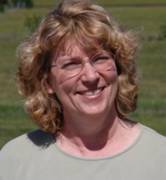 I’m pioneer writer Linda Hubalek, roaming the Internet—via my laptop—on a WOW! Book Blog Tour. Because my Trail of Thread book series weaves stories and quilts together, the Quilting Gallery is a perfect stop to tell you a little bit about the series. 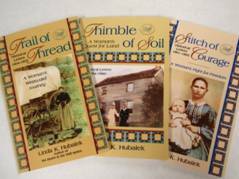 I’ve written ten books about pioneers; about women that forged trails and built homesteads during the 1860s to the 1910s. These main characters were my ancestors who decided to make the Kansas frontier their home. A woven mixture of facts and fiction, you’ll be drawn into their pioneer stories. Quilts and quilting seemed like a perfect theme for the stories of my mother’s side of the family after my mother told me the story behind one special quilt she’s had since she was a teenager. In 1938 my mother’s great aunt Martha Pieratt gave her a quilt. At that time the quilt was over 100 years old and had been handed down through her mother’s Kennedy family. 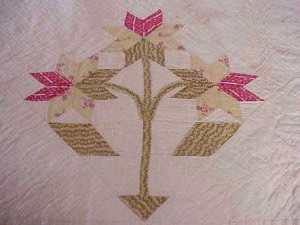 Doing some research on it while planning my Trail of Thread book series, it turns out to be the Cleveland Tulip pattern and it traveled with Martha’s mother Maggie Kennedy when she moved from Ohio to Kansas in 1858. So I wove a quilting theme into the titles and the Trail of Thread book series by featuring twelve quilt patterns in each book. My Trail of Thread book was about my ancestor Deborah Pieratt’s wagon trail journey to the Territory of Kansas in 1854. The second book, Thimble of Soil featured Margaret Ralston Kennedy’s decision to move her family from their safe Ohio home to the unsettling territory in 1855. And the final book in the series, Stitch of Courage, followed Maggie Kennedy Pieratt during her young years as she marries James Monroe Pieratt during the Civil War. As I work on my fourth series, The Kansas Quilter, I’m taking a closer look at the family quilts that my great grandmother Kizzie Hamman Pieratt made during her ninety-seven years. I think of the time it took to make each quilt, the preparation, the cutting of the material, the hours sewing the blocks and then quilting all the layers together. And who helped her put them together? What conversations passed across the quilt frame? What was going on in the community, state and world during the construction of that particular quilt? These are just a few of the questions I’m trying to “stitch” together as I research and write about this pioneer woman that spent so much time making quilts. Please join me in this new “quilting” project by reading my blog and “liking” and following me on Facebook as I post tidbits and photos about Kizzie Pieratt. I think she’s a Kansas pioneer quilter you’d like to meet. My Stitch of Courage book features Maggie Kennedy Pieratt, my great-great grandmother. She was orphaned at age three, and eventually sent to the Territory Kansas in the late 1850s to live with her brothers. As a young woman, and arriving in the Territory of Kansas at the end of the period known as Bleeding Kansas, she didn’t realize the effect of the war would have on her state and family until she was thrust into it. In her letters to her sister in back in Ohio, Maggie describes how the women of Kansas faced the demons of the Civil War, fighting bravely to protect their homes and families while never knowing from one day to the next whether their men were alive or dead in a faraway battlefield. She was married in 1864 and her new husband was mustered into service just six weeks later. Can you imagine the worries for her husband James as he left home? The Civil War caught Americans by surprise and forced them to cope with extraordinary circumstances. Maggie was just one of millions of women who had to live through this horrible situation.